of the 120-acre Coliseum complex. A day after Oakland Athletics management announced its interest in purchasing the entire Coliseum complex, the Alameda County Board of Supervisors on Tuesday afternoon voted to enter into negotiations with the team. The action is just the first step in resolving the future of the 120-acre property and potentially becoming the site of a new ballpark for the Athletics. 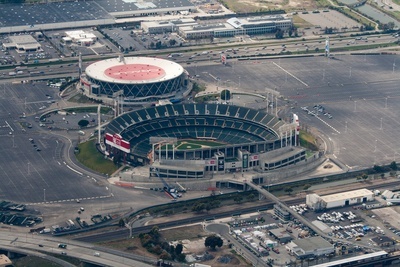 Since the complex is owned jointly by Oakland and Alameda County taxpayers, any sale to consolidate ownership under the Athletics would also entail a willingness from the Oakland City Council. Following costly remodels of the Coliseum and Oracle Arena, county taxpayers are on the hook for roughly $135 million in bond debt. The estimated $10 million in annual debt payments has been a significant drain on both city and county budgets for years, say officials. Under its initial proposal, the Athletics are proposing to wipe away that debt in exchange for the complex. The notion of one half of the ownership structure selling its interests was initially floated by some Alameda County supervisors back in 2014. Participation in operating sports facilities always ran counter to the board’s core function as a safety net for the county’s less fortunate. Alameda County Supervisor Keith Carson was one of the first to express sentiment for selling the county’s half of the property during discussions with the Oakland Raiders for a new football stadium. But as the Warriors and Raiders’ era in Oakland are nearing an end following moves to San Francisco and Las Vegas, the idea of divesting from the Coliseum has gained steam at both the county and city levels. The Athletics, in a letter sent Monday, expressed a need to secure the Coliseum property in the event it chooses to build a new privately-financed ballpark at the site or some other property, possibly at Howard Terminal, just north of Jack London Square. Posted in Alameda County, Alameda County Board of Supervisors, Athletics, bond debt, coliseum, negotiations, Oakland, Oracle Arena. Bookmark the permalink.